One of the most frequently asked questions I get at lectures and from hospital transfusion services goes something like this: “What the HECK (or words to that effect) is anti-G? 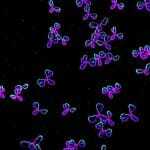 !” Most people have heard of the G antigen, but too few are familiar with it. So, if you’ve asked that question, don’t despair; you aren’t alone and I’ll make a G-wiz out of you yet! 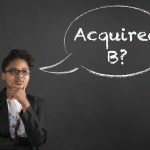 A thorough understanding of G will make you a better advocate for optimal patient care, and can also be used to impress people at cocktail parties and watercoolers, as well as being a guaranteed way to put your kids to sleep at night. Trust me, you don’t want to miss this; I’m glad you’re here. Any discussion of G has to begin with a basic understanding of Rh blood group system nomenclature and genetics. 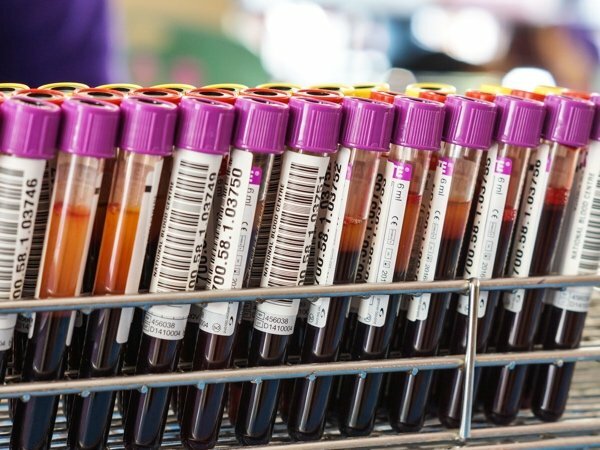 I have covered this elsewhere on the Blood Bank Guy website, so if you aren’t completely clear on Rh and how the terminology and genetics work, go now and check out the details (then come back, ok?). Notice again that G is present when D is present without C, when C is present without D, and when D and C are both present in the image above. It should be pretty obvious, then, that most people are G-positive, as the only possible genotypes (combinations of the above haplotypes) that would result in someone being G-negative are rr, rr”, and r”r” (rr is by far the most common of those, seen in around 15% of the U.S. Caucasian population; the other two genotypes are seen in less than 1% combined). Put another way, the vast majority of G-negative people who could make anti-G are D-negative with the rr genotype. NOTE: OK, to be completely honest, there are a very small number of D+C- people that lack G, as well as a very small number of D-C- people that have G. These are the exceptions rather than the rule, but either situation can definitely happen. 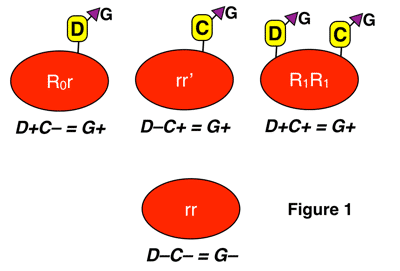 Biochemically, expression of the G antigen depends on the presence of a common amino acid (serine) present on the surface of both D and C antigens (encoded by the three alleles I mentioned above, RHD, RHCe, and RHCE). I have shown G “sticking out from the side” of the D or C antigen in the image above, and in figures 2 and 3 below. There is much more detail in that discovery. Out of respect for your valuable time, I will skip that esoteric discussion and move on to anti-G and its significance! 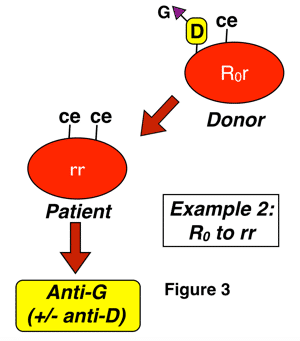 In figure 2 above, a D-negative patient is exposed to the G antigen through interaction with a D-negative, G-positive person who carries G as a result of the action of RHCe (r’ haplotype). This interaction could occur with pregnancy, and is also typical of a presentation seen after transfusion (such interaction, by the way, is completely unpreventable in transfusion, as the donor in this case would appear completely compatible with the recipient, and we don’t routinely screen D-negative donors for the presence or absence of the C antigen). In this case, you would not be surprised at the formation of anti-C, but if you were unaware of G, the added anti-D specificity would make no sense! In figure 3 above, a D-negative patient is exposed to G through interaction with D-positive-C-negative-G-positive red cells, either deliberately during a transfusion (most commonly an emergency or massive transfusion), or as a result of pregnancy. Again, a cursory examination would not leave you surprised that the patient has an antibody with anti-D specificity, but the anti-C part of the specificity is only explained by the presence of anti-G. Please note that this is only one example, and any combination of D-positive red cell exposure (whether from donors with C as well, such as those with R1 or Rz haplotypes or from those without, such as those with R0 and R2 haplotypes) could potentially lead to anti-G formation in this D-negative recipient. The difference is that you would not be surprised to find anti-C + anti-D in situations when a patient was exposed to both antigens. Why do we care, anyway? You may be thinking, “Gee, Joe, I think I get it, but why do I care? What difference does it make if a patient has a single antibody (anti-G) or TWO antibodies (anti-D AND anti-C)?” This is an excellent question. 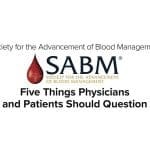 The short answer: From the perspective of a patient who is about to be transfused, the distinction makes NO difference whatsoever. 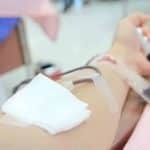 A patient with anti-G would be transfused in exactly the same way as a patient who has the combination of anti-D and anti-C: With D-negative blood. 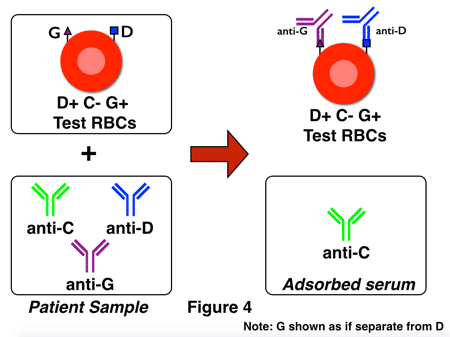 Remember, almost everyone who is D-negative has the genotype rr, meaning that they should be negative for D, C, and G (a transfusing laboratory would, of course, verify that the person was D- and C-negative before the transfusion). The slightly longer answer: The distinction is much more important in prenatal workups and in managing a pregnant patient. Why? Knowing whether a patient has anti-D or should have RhIG to prevent future anti-D formation is an important distinction to make in determining a prenatal patient’s clinical treatment course. Seeing a patient with an apparent anti-D and anti-C and making an assumption they are not an RhIG candidate could have significant consequences if that patient has, in fact, instead, an anti-G. If you really want to make your brain hurt, just ask an immunohematology reference laboratory technologist about how to separate anti-G from anti-C and anti-D; you will be running for the ibuprofen before you know it! You will hear about “double adsorptions” and “testing adsorbed eluates” and the like (my first mentor in immunohematology, the fabulous Connie Howard at the Walter Reed National Military Medical Center, taught me long ago that it’s a complicated process, and I remember thinking at the time that I must be just too stupid to completely understand all of the details!). Let me try to make it easier for both you and I…with pictures! 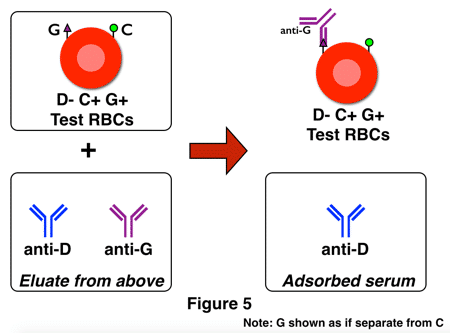 The first adsorption should have selected only anti-D and anti-G, and the second deliberately uses D-negative, G-positive RBCs so that the only possible antibody out of the two remaining that could adsorb onto these cells is anti-G. Anti-G is then eluted from the cells and identified as anti-G by its activity when tested against C and D positive RBCs. 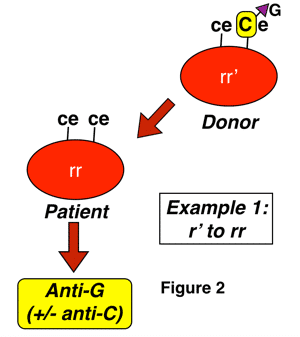 Here is the key to understanding the two figures above: If no anti-G is present, following the same steps with only anti-C and anti-D would leave you with a final eluate that was completely negative, or non-reactive, with G+ cells. Note that in figure 6, no anti-D is present. The technologist would test the adsorbed serum, note the lack of anti-D, and recommend the administration of RhIG (assuming that the pattern of anti-C plus anti-D was caused by anti-G). In the second example, in figure 7, anti-D is present in the adsorbed serum and would be identified on testing that serum, so the technologist would not recommend RhIG (though the presence of anti-D opens a whole new discussion about management of the pregnancy, etc). Seriously, you are still here? Wow, thanks! 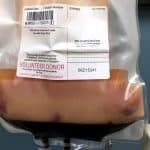 I apologize for the length of this post, but I felt it was important to be more thorough than most regular blood bank references, because so many people don’t understand this topic. Adsorptions and double adsorptions, oh my! I look forward to your further questions and comments on this tricky topic in the comments section below. Sooooo glad to be retiring in 21 months! 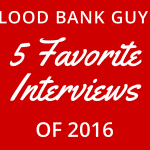 As a generalist with blood bank duties, the thought of more is getting old. Thanks for your dedication to educating those who need to be aware. Sharon, you are too kind! “Treasure?” No, not at all, but thanks for understanding that I am dedicated to education. Please enjoy your 21 months before retirement! As I’ve said in other forums, I hope that now and moving forward (even after retirement) that you will never, ever stop learning! Thanks Malcolm that was very good explanation. we recently have patient with Anti-G+ Anti-D. In terms of quantification would perform this process every time you received the sample? Another superb addition to education Joe, although I will never understand why you scientists in the States bother with the elution!!!!!!!!! I too will be retiring soon (31st October 2016), but I will NEVER stop learning; it is just too much fun. Just joined this site. Now I see Malcolm Needs name here I know it must be a worthwhile read. Enjoy your retirement, Malcolm. Malcolm, I’m really interested to hear how a G workup differs in your lab! Fill us in! Have a great retirement Malcolm. You beat me to it by 11 months, if I make it to September 2017. What will we serologists do in our dotage if we don’t have wonders like anti-G to deal with? So enriching.With a master in Immunology and looking forawrd to sitting for the ASCP SBB exams,there is so much to learn, new and exam oriented details. Great subject! We once had an AABB Reference proficiency for anti-G. Half the participants called the anti-C which wasn’t supposed to be there and failed and it was ungraded. I do have a question about how one would follow a prenatal patient with an anti-G, and/or anti-D, and/or anti-C. Normally we do concurrent titers (Past and present samples)using a heterozygous cell of the offending antigen for weakest expression. A change between present and previous samples indicate the HDN is getting worse. HOWEVER..There appears to be no cells for D and C that don’t also have G. How does one know what they are titering, the D , the C, or the G? Can we just pick two cells, DG (R2r), and CG (r’r), and titer them over the course of the pregnancy. Any increase would be significant regardless of the culprit? What do folks do? Thanks for the site.. It’s really cool! Hi! We are blood bank girls from Madrid La Paz University Hospital. Congratulations for your work! 22weeks pregnant lady rr, with a D positive fetus. In our lab, we end up with an eluate made from adsorbing cells which contains anti-G… lots of my co-workers want to perform titration studies on this eluate, but I am hesitant, as eluates are very variable in strength, depending on how much buffer is used, etc. Any ideas or thoughts? I’m not sure about performing titers on an eluate, Sara. I personally would be concerned about artificial concentration of the antibody. I’d be happy to hear opposing views, but that would be my concern. This is my first week working/training in a trauma 1 blood bank. I have two bookmarks on my work computer so far: my e-mail, and BBG. Cool blog, thanks for your effort! I’m honored, Vince! Good luck! Excellent Joe. Your are a very very good teacher. thank you very much. You are very kind, Dr. Khan. Thank you. Dr Joe i must say you are an excellent narrator….excellently clearified all the ambiguities in a quick review..thanks a million. Thanks so much! I’m very glad it was useful to you. That was great, presenting the complex part with such a simplicity. Kindly throw some light on possibility of having anti-G in RH D-positive female. Is there any utility of Rh Immunoglobulin if the mother is weak D or D positive? Q1: Almost always, D-positive people are G-positive people, so anti-G should not be present. There are rare examples, though, of people that are D-positive but G-negative, so a person like that could theoretically make anti-G.
Q2: For weak D’s that are at risk for making anti-D with exposure to D, RhIG is recommended. Most recommend genetic (molecular) D typing to know for sure if the mom is at risk. For regular D-positive moms (ones without a D variant), there is no utility. Could you explain for us type 1/2/3 weak D’s, what is the difference between them, does they gave positive reaction with AHG phase? Thank you very much for your interesting presentation. Ash, I did this on the BBGuy 5 in 10 session yesterday on Facebook Live. Thanks for sending the question! Thank you very much for your time and efforts. 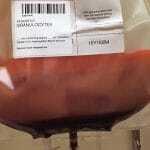 Could I say safely that people on regular transfusions with D variants should be genotyped? That is the current recommendation in the U.S., yes. This issue is really better for the discussion on the Rh genotyping podcast episode. Thank you, I’ve always had the doubt, my blood type is O, RH-, Anti G, and I asked what it was. and was told just a variation, not to worry. Absolutely brilliant article. Can you shed light on why the literature (and my very limited personal experience) indicate that anti-G should be suspected when the strength of agglutination is greater with D=C+ reagent cells than with D+C=? Well, Adam, the deal is simply that anti-G typically gives a lower titer of positivity with D+ cells than real-live anti-D. What I don’t know if ANYONE knows is the “why” behind that. I asked two world-class, brilliant immunohematologists that very question (Sue Johnson and Dr. Connie Westhoff), and they suspected that the reason is that many people with anti-G are actually immunized with C+D- cells rather than the other way around. However, I I’m not sure that anyone knows for sure. I’d summarize the approach this way: If a person appears to have anti-D and anti-C (anti-C+D), and the titer against D+ cells is less than the titer against C+ cells (the opposite of what is usually seen), one should suspect that anti-G is present rather than anti-D. Such a finding is not definitive, but is most often true. Anti-G is totally possible in the case you are describing! Male or female is irrelevant in whether or not a person forms anti-G (aside from the pregnancy issue, of course!). In the setting you describe, if the man received blood from a r’r donor (D-neg, C-pos), he could certainly have formed anti-G. The article above describes how this could happen. Here is case that has always been in the back of my mind. I’m just starting to understand Anti-G so bare with me if it sounds like I have no clue what its all about…pregnant female laboring a still born baby at 34 weeks gestation. Early labor but baby was ok until just a couple hours into labor when it started showing distress and a c-sec was done, baby was not alive upon being born. Mother is B positive with a weak D expression and C-. After running panels showing an apparent anti-D we questioned the nurse for more patient info. This was her first pregnancy, no RHIG given ever. Patient had a splenectomy about 10 years before this and was transfused with platelets but not red cells. After more specific phenotyping by a reference lab it was determined she had an Anti-Goa (not sure what the “oa” really is.) Doctors didn’t know if the antibody caused any harm to the baby. Patient returns about 4 years later with premature labor on a baby that was born alive but had a NICU stay due to jaundice. Baby’s red cells tested positive for G and was Rh+. All that being said, should this patient have been given RHIG? 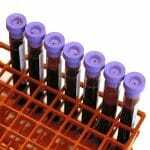 What special precautions can be taken if the patient needs blood transfusions in the future? Should any special care be taken for future pregnancies? Massy, anti-Goa is not the same as anti-G. Goa is an uncommon form of the D antigen that is actually a variant D antigen (what we used to call a “partial D”), so the discussion is very different than that in this particular blog post. The antigen has gone by different names, including “Gonzalez” (that is the Go part), “DIVa,” and what we usually call it now: “Rh30.” It’s interesting to note that the patient you mention showed “weak D expression,” because if she carried that particular antigen, it has been reported to have increased expression. Anyway, all that to say that the story is more complicated than it seems at first glance. There’s no way for me to tell exactly what happened without more test results from both mom and baby. I can say that it seems unlikely that anti-G was the issue. Thanks for writing and forcing me into the dim recesses of my memory for the Rh30 discussion! Love you lectures! Make it so easy for me to understand! And it is so fun to read – “…running for the ibuprofen…”. Lol, Dr. Chaffin, you are one of the BEST! Well thanks, Eric! I’m glad you could have a smile while learning something new. Lorie, thank you for your kind words. For Micro, the best review site I know of is run by my friend Dr. Margie Morgan (http://www.microbeswithmorgan.com). She’s awesome, and is a great microbiology teacher (and THAT comes from a person who can’t stand micro!). I wish you the best. Possible? Yes. Not common, though. Greatings from Portugal! Great blog, already added to my bookmarks! 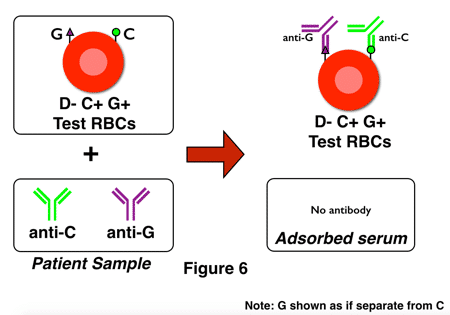 From what I could understand from your post, it’s only possible to find Anti-G if you have test RBCs G+ ; is there any way that we could separate Anti-G with only D+ and C+ test RBCs? Great explanation – love your style! Dear Joe: Very interesting. I am in my 68th year of working in a lab and I just learned more from you. When we started we called the GOa a mutation of D+. I’m honored to have provided something helpful, sir! Thanks for writing. I just had antibody screen on a 10 week pregnant patient return with anti-D and anti-C antibodies. She is D positive. Could this be explained by her being one of these rare D antigen positive, G antigen negative individuals? Sure, that’s possible, but there are other possibilities. It’s more likely that the person has a D variant (partial D) and has formed anti-D as well as anti-C.
Do we have any data about G antigen expression on various phenotype. Which one have highest and which one have lowest. your articles are truly wonderful. concepts are well explained. thank you very much for all the efforts. I have a little story/question I hope you can help me with. When I was pregnant with my third baby the doctors found out I had developed anti-G. It did not increase, and they thought that the baby would not be effected. They where wrong. My baby got anemic just a few hours after birth, jaundice and signs of infection. We struggled for a year because she didn’t make enough red blood cells. Why did this happened? Where they not able to titre the anti-G? Could this have something to say for my daughters future? Thank you for writing. I’m very sorry to read what your daughter and family went through. Unfortunately, there is just no way I can tell what happened without having much more information about the case. I do not offer consultation for issues like this through my educational web site. 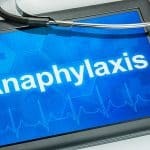 I would suggest discussing with local medical personnel. I wish you the best. Thank you so much for your reply. I really appreciate you taking your time. The medical personnel where I live have little to no knowledge about the Anti-G. So I’m trying to do my own research. Dr. Chaffin, can you please make a video lecture on this?? 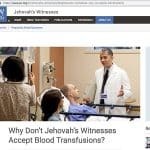 I love to watch the youtube series on bloodbank and it would be so helpful if there were a video lecture on this topic!